fanfare "...this recording shows them (duo46) to be superb players"
Karl Korte (b.1928) is a scrupulous composer of music that’s of high quality and not easily categorized (disclosure: though I’ve never met him, wrote the notes for one of his CDs, and am cited on his Web site). These three works are the fruit of his ongoing recent collaboration with Duo46: Matt Gould, guitar, and Beth-Ilana Schneider-Gould, violin. Korte has a gift for writing music that’s fluid (it always has an idea and knows how to develop it), focused on clear and memorable motives, and harmonically rich but neither chromatically clotted nor too tonally predictable. He has a naturally sophisticated rhythmic sense. Two of the three works also show a sympathy for musics from non-Western classical traditions. The trio Evocations (2004) takes inspiration from New Zealand Maori, Japanese, and Cypriot sources. The 2003 Two Makams are derived from Turkish musical practice. In all of these there’s a sense of natural engagement with these traditions, neither ethnographically slavish nor culturally cavalier. Another form of engagement is with the electroacoustic tradition, represented by Virtual Voices (2007), for the duo with fixed media accompaniment. This is a substantial work, almost 20 minutes long, with the electronic component being a recording derived from samples of the performers that are in turn processed and layered. The blend is subtle and smooth; rarely are there dramatically perceptible differences between the live and recorded. Rather, one feels a general expansion of the performative field. My only reservation is that without seeing the piece I find it hard at times to distinguish what is “live” and what “taped” (shades of Memorex!). This isn’t a criticism of the piece, so much as of the best means of presentation and archiving. But all composers do their best with what they can. Perhaps Korte’s greatest contribution is simply creating this body of work for Duo46. I’ve been hearing of them for some years now, and this recording shows them to be superb players. Their instrumentation is a beautiful balance—two strings, both relatively homogeneous in timbre but with a wide variety of special effects, one plucked and one bowed (though of course the violin has pizzicato in its arsenal). Similar and also very different. The result is an extremely satisfying chamber sound. I know there’s a good deal of literature for this pairing, but most that I know of tends to be more in the parlor/salon genre. Duo46 (four strings and six strings, I assume) demonstrates with this disc that composers should be stepping up to the plate and creating works of substance and variety for the medium, as it seems quite capable of handling them. Overall, a very appealing project, well performed and produced. classical guitar canada "Duo46 has brought the music of Karl Korte to life infusing it with rhythmic drive, colour, and expression"
I must admit that I was not familiar with Karl Korte before hearing this recording but I’m now certainly convinced of his valuable contribution to the classical guitar repertoire. This recording has a great deal of variety showcasing the guitar with violin, with violin and cello, and with violin and pre-recorded digital sounds. 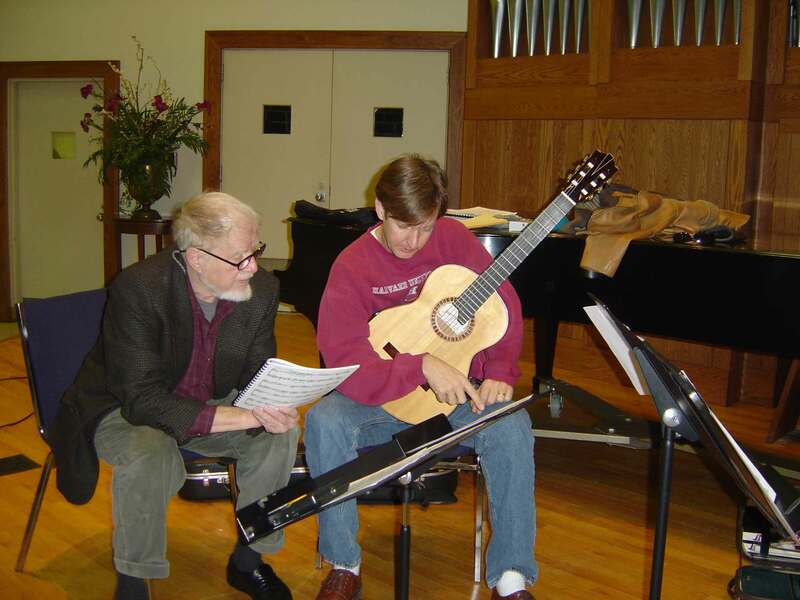 Karl Korte is an American composer and emeritus professor at University of Texas at Austin and “From 1997 to 2000 he was a visiting professor at Williams College in Williamstown, Massachusetts. He lives in Cambridge, New York.” (see his wiki). Evocations, as the programme notes explain, evoke images of places where the composer has visited or would like to. The musical language is somewhat dissonant but at times very beautiful as well. The addition of cellist Erich Huetter is a welcomed and fills out the sound on both the high and low end. In Te Maori, the first movement, The guitar plays largely a rhythmic role with a variety of textures from rasgueado, to an array of percussive golpes, slaps and drumming effects. It’s very effective and practical for performance. The music is based on transcribed fragments of Maori music of New Zealand that the composer collected while in the country in 1985. Very interesting drone effects and a great sense of forward movement. The melodic material reminds me of African music in some regards but has a very distinct rhythmic character of its own along with angular lines and accompaniment figures. The second movement, Aki, I assumed was a reference to a place, either the Japanese city of the same name in the Kochi prefecture or the district in the Hiroshima Prefecture. However the programme notes state that Aki is autumn (fall) and is based on an earlier work titled Shiki (the seasons). The guitar takes on more melodic styles of accompaniment here which evoke the sound and style of the Japanese koto. Very interconnected textures crossed between the instruments and a meditative awareness of space. The third movement, Cyprus, is an island country located in the Eastern Mediterranean Sea. The music uses rhythmic and melodic modes influenced by Turkish music. This movement is very conversational between the instruments and highlights expressive melodic work in the strings with the guitar, for the most part, returning to accompaniment. Excellent playing by all with a real mature musical approach to rhythm. The drive forward is sometime intense and at other times very spacious. I’m impressed not only with the individuals but the synergy of the ensemble. Two Makams, again the guitar is a real rhythmic force with a good deal of percussion written in. This is again a Turkish influenced work from a rhythmic standpoint with shifting time signatures and a certain degree of asymmetry. However, the guitar is more interactive melodically in this duo. The ensemble work on this track is spectacular! I really appreciate the rhythmic intesity of the writing but also the drive of the performers. This is my first time listening to Gould and I’m impressed with the playing in regards to the recording. It can be hard to strike a balance between clean playing and risk taking but I think the playing is very mature and confident in style as to make for an excellent complement to the strong string playing. Bravo! Virtual Voices, is a work for guitar, violin, and pre-recorded sound. It opens with a motivic conversation based on the tuning pitches of the instruments. This ‘tuning up’ session grows in intensity begins to mix with the pre-recorded sounds. All the sounds are samples of violin and guitar. The pre-recorded sound is very much in the 1970′s style with the usual bag of tricks in terms of manipulation. The blending of the sounds with the instruments is very effective. If I hadn’t listened to the other tracks on the album I might have not been very interested in this work but the style is consistent with the composer’s other works which helps to organize the way the sounds integrate, especially rhythmically. I like the percussive textures around 7:30 and the conversation between the instruments. Very well executed by the ensemble, it sounds like a difficult work to perform and synchronize with the tape but they pull it off flawlessly. Big thumbs up to Gould who has some extremely complex and difficult passages on the guitar, his guitar playing in these complex rhythmic textures is par none. classical guitar review "FOLK OR NOT, SEPHARDIC MUSIC FOR THE AGE"
How do you put into words what is essentially a “stream of consciousness” experience and capture the composer’s main ideas? It’s one thing to write about an evocative scene that describes the beauty of the Alhambra, quite another to get inside the complex musical ideas and rhythms of Karl Korte (b. 1928). As the liner notes indicate, music by this distinguished American composer is difficult to classify. His compositions reflect influences of Maori, Turkish, Arabic, Japanese and other cultures. He is an explorer – a discoverer – and a reinterpreter. His aim “to blur the boundaries between the instruments” works extremely well in this collection for guitar, violin and cello. 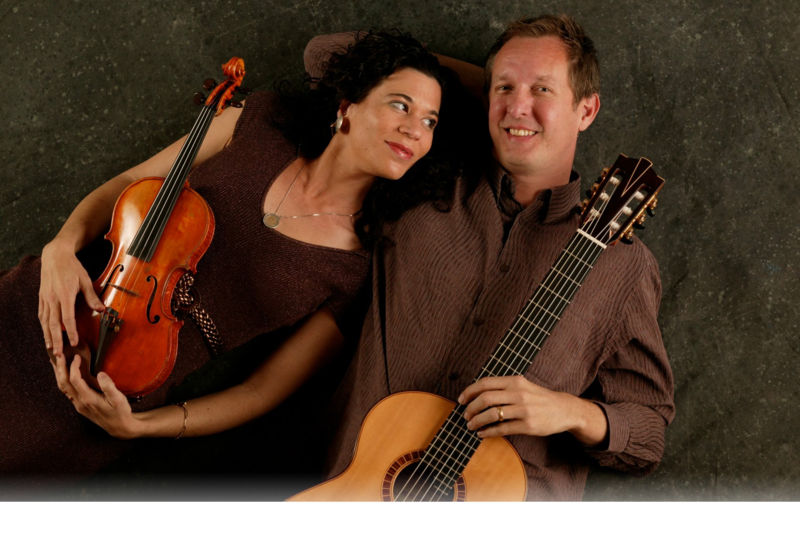 Duo46 (American guitarist Matt Gould and violinist Beth Ilana Schneider-Gould) are joined by cellist Erich Oskar Huetter in the 2004 composition Evocation, a work that “evokes” impressions from the composers travels – both actual and imagined. The intricate rhythmic ideas must surely require enormous effort and concentration by the performers – lots of sideways glances and nodding gestures – making a live performance perhaps nerve-wracking for the musicians and intellectually engaging for the audience. This same feeling occurs again in the duo’s interpretation of Two Makams (2003) in which the asymmetric patterns found in Turkish time signatures shift throughout the piece. Both Matt and Beth are on firm footing due to their own extensive and distinguished work around the world, including their residency at Eastern Mediterranean University in the Turkish Republic of Northern Cyprus in 2004. The 2010 release of this CD highlights the immense artistry and musical scholarship of these two fine musicians. Their extensive repertoire, extending back to the ensemble’s 1994 formation, is noteworthy for their strong advocacy of chamber music from the past 100-odd years. Bravo to them both! This CD will reward a serious listener with its riches and insights. The music of Karl Korte has a scope and a variety that makes classification of it difficult. Professor Emeritus of Composition at the University of Texas at Austin and recently a Visiting Professor of Music at Williams College, he is now retired from teaching and lives in Cambridge, N.Y. Raised in Englewood, N.J. his father was a sculptor and was responsible for his earliest exposure to classical music. In high school, his musical influences and activities were mostly in the areas of jazz and popular music, and he played the trumpet in a variety of bands and orchestras. After discharge from the Army, where he played trumpet with the First Army Band, he entered the Juilliard School where his teachers included Peter Mennin, William Bergsma and Vincent Persichetti. Later teachers include Geofreddo Petrassi, Otto Luening and Aaron Copland. Over the years he has created a body of work that ranges from chamber music to symphonies, as well as choral works ranging from oratorios to a number of short works intended for school and church use. Much of this music has attracted attention through publication, performance, recordings and many significant national and international prizes and awards: two Guggenheim Fellowships, Fulbright Grants to Italy and New Zealand, Grants from the Ford Foundation Young Composer's in Residence Program, a gold medal in the Queen Elizabeth International Composition Competition, Grants from the National Endowment for the Arts, First Prize in the Missouri Contemporary Music Competition, as well as awards from the National Flute Association, the Vanguard Arts competition and the Tampa Bay Composer's Forum. In 2002 his Four Songs of Experience (Blake) for treble voices and piano won "Top Honors" in the Waging Peace Through Singing international competition. In addition to his acoustic compositions, Korte has written many works making use of electronic media. (One of his earliest efforts in this respect was Remembrances for flute and tape. Recorded by flutist Samuel Baron for the Nonesuch label in 1971) In the mid '80s, with the ready availability of digital recording and processing equipment, the composer returned to electronic music, and created a number of compositions using this new technology. Although several of these works are for tape alone, most of his compositions in this area involve the use of a live instrumentalist whose pallet of sounds has been "extended" through the addition of a taped electronic accompaniment. STAY UP-TO-DATE WITH DUO46 AND FRIENDS.